I haven't managed to post any updates lately due to mad hours at work and life in general, and I apologize. What I plan to do now is start hobby video updates, to track and share my progress on the many 2013 games I plan to get into playing more! Here is Video #1 - Enjoy! Stay tuned for more updates. Thanks for watching! Best 15 dollars ever spent: 1940's era fuel truck for the airfield board. I had commissioned Jeff Black of OMG club for the awesome hangars. Also, plane nerds, what is the large 2 engined bomber? Hint, it was actually used against the British, and its not a Condor. Thanks to those that brought extra planes.. here is the "captured german stuff"
And here is the allied stuff.. I want that Halifax model something fierce! Quite a messy cluster of Germans vs Staghounds. 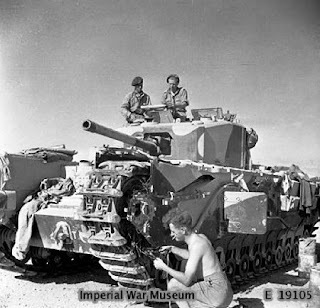 My Shermans later found out that some of 'em have AT 10 CrusaderIII turrets!!! Mike Abbott's incredible Para's army. This army got my best painted vote, though to be fair the lvl of painting keeps climbing higher and higher at each event, so its getting tougher to pick a clear winner. Big thanks to the GS Set up crew, the Dice Devils set up volunteers (the free breakfast is a lie) and bigger thanks to Ca$H, who ran the event for us again this year. It was a smashing success, good show old boy. Here is my video of the setup, as I don't vid during tournies anymore. Just a quick look in at our setup evening for the Flames of War Tourney running this weekend at GameSummit.